No, this isn’t a New Year post! 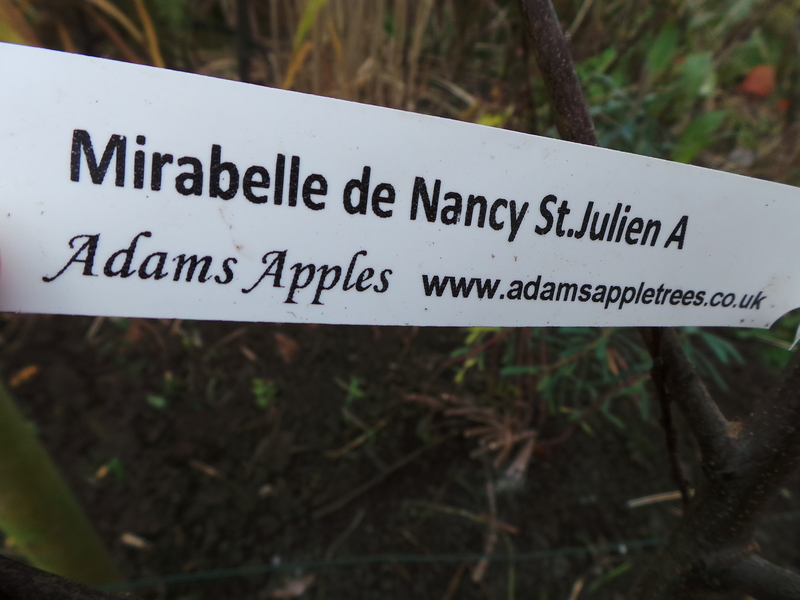 It is about fruit trees. 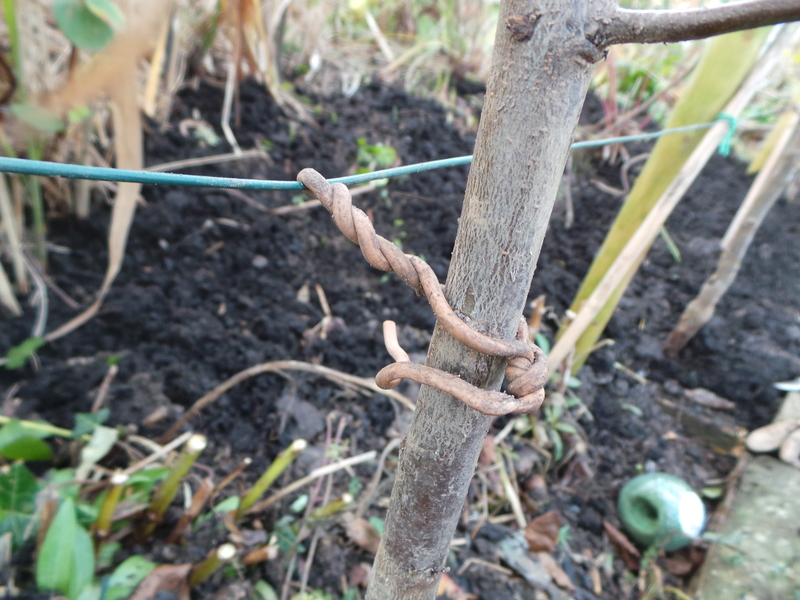 We have had a row of cordon grown plums along our central path since we first created our garden about ten years ago. They fruited well to start with but in the last few years they have struggled to produce just a handful of plums each or at worst none at all. Hence it was time for out with the old and in with the new. 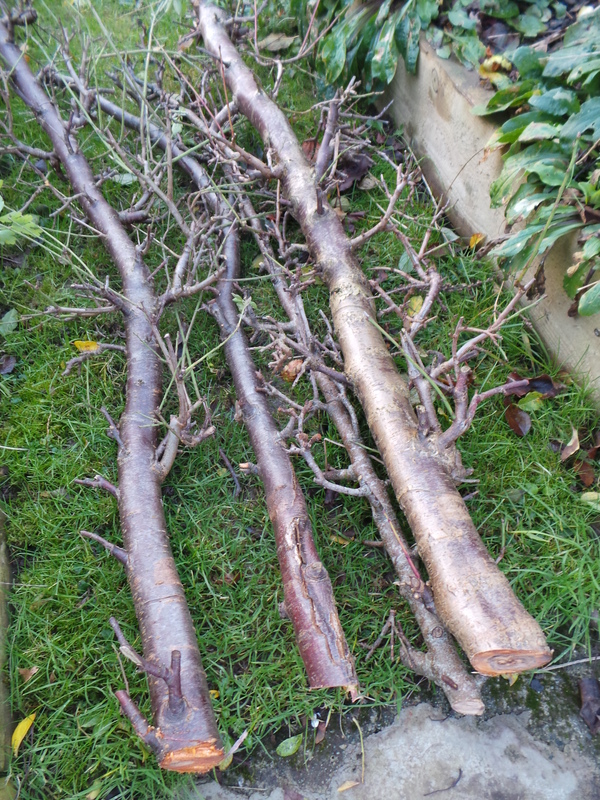 The new trees arrived by courier all the way from Devon bare rooted and packed beautifully in the same way my Father used to receive his plants back in the 1950s. It is amazing how small a package of 4 trees looks. 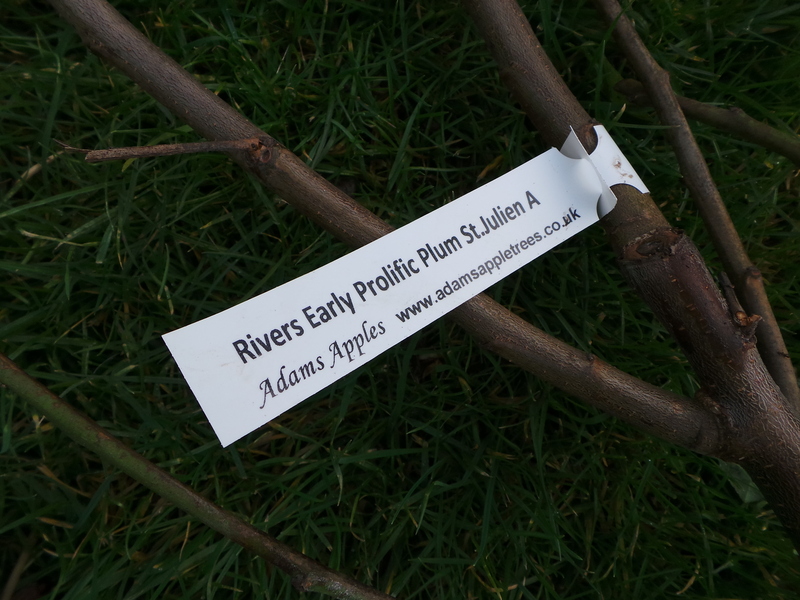 We ordered them from Adam’s Apples also known as Talaton Plants, a firm we have used to purchase all our fruit trees from for home and the allotments for many years now. We have never had a tree fail! 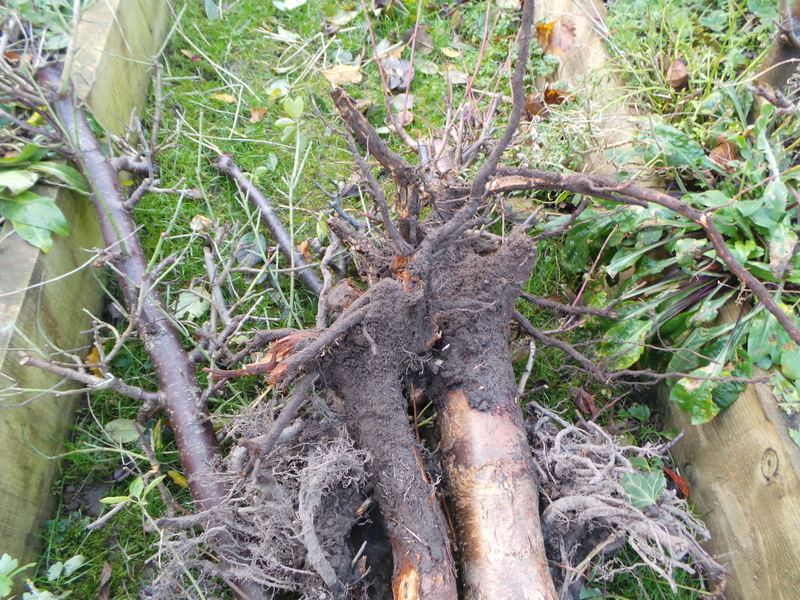 As the photo below shows they arrived with top quality root balls. 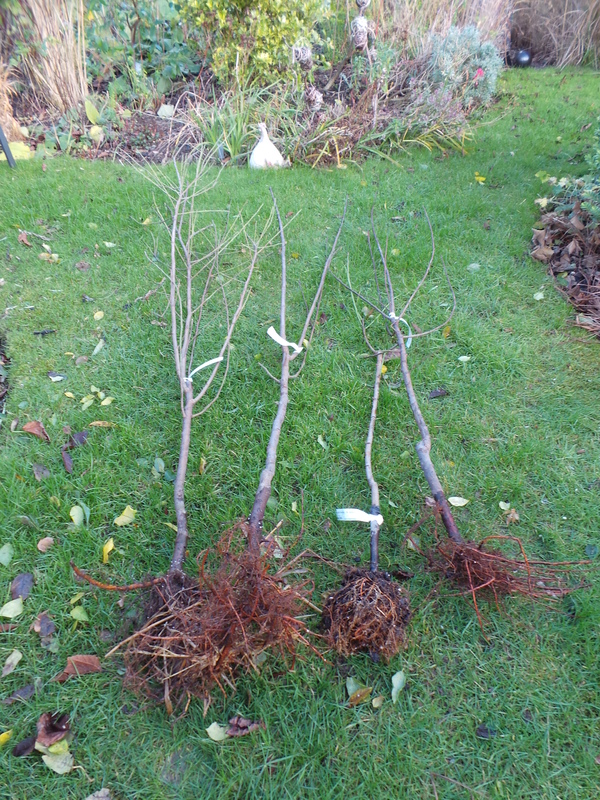 Without a good root ball a tree will not thrive so we were delighted with these. First job was the hardest, getting up the old trees. 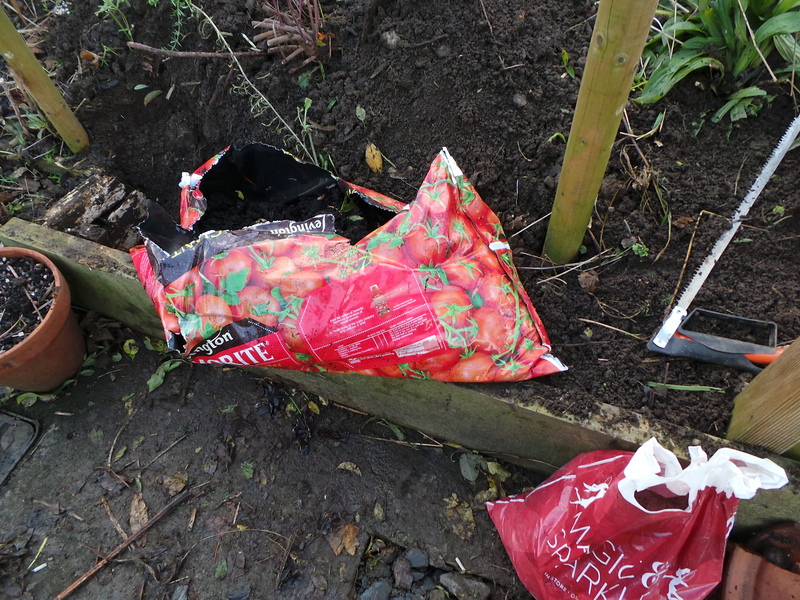 Luckily the soil was soft and easy to dig. 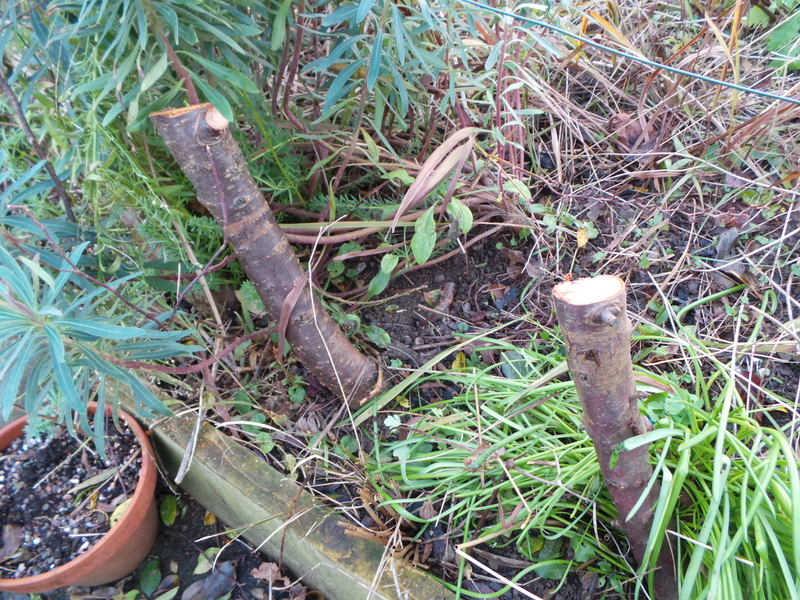 We chopped the trunks down leaving just the right amount to act as a lever. 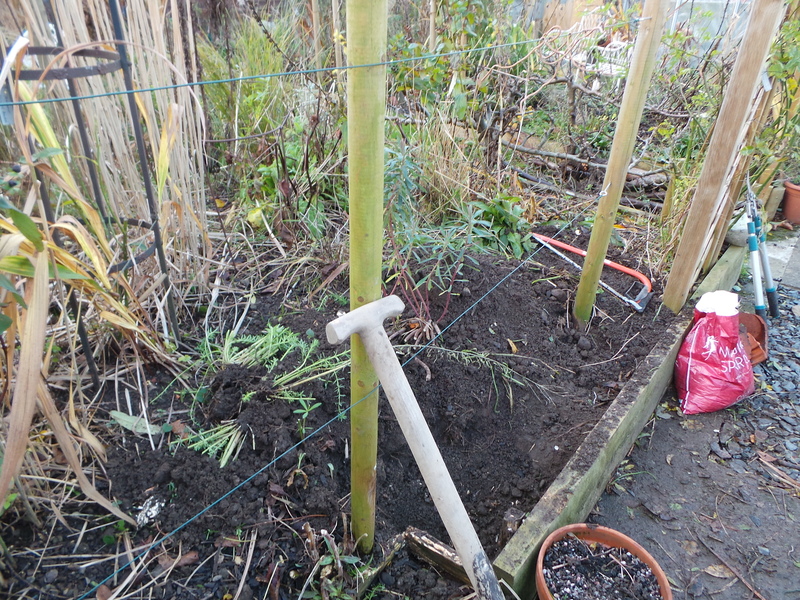 Luckily the task of digging out the roots was not as difficult as anticipated. 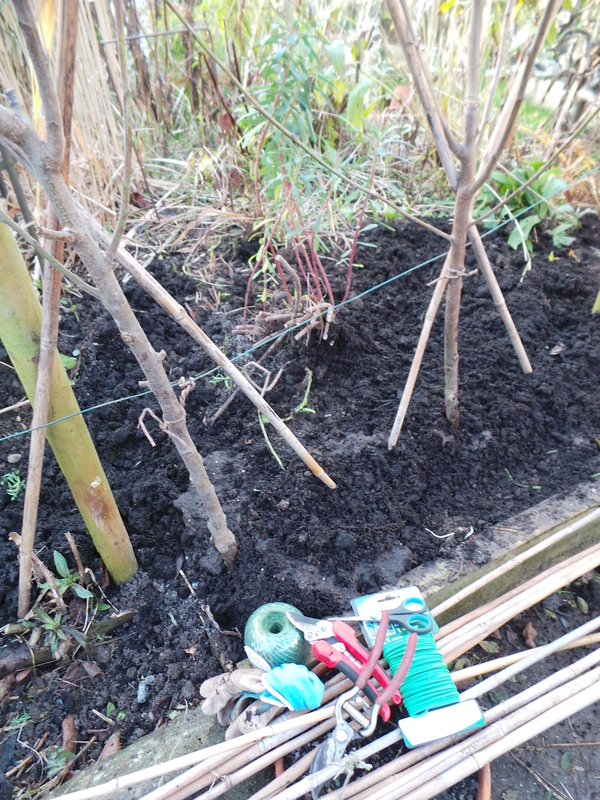 We then improved the soil structure by adding in the compost from the old “growbags” in which our tomatoes had spent the summer. Then we added some wood ash from our woodburning stove and open fire to encourage blossom and fruit next season. 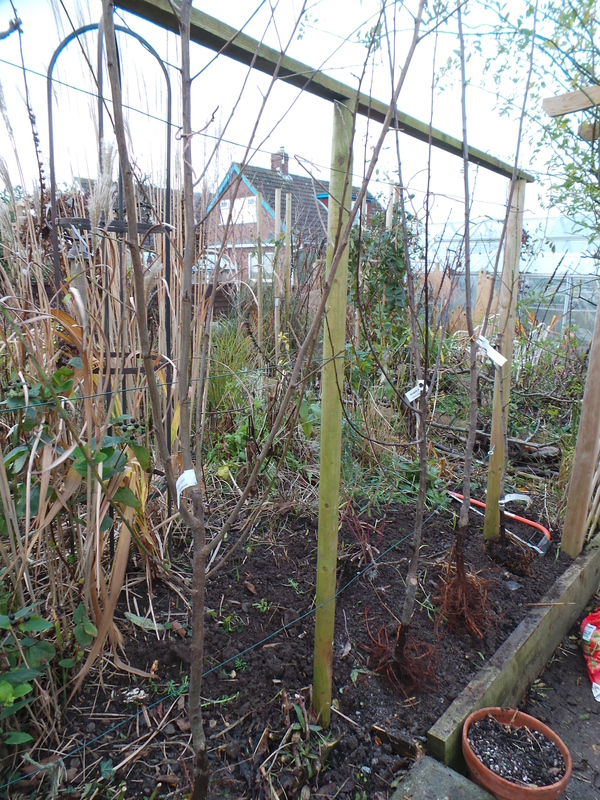 We placed the new trees to check they would look okay and then planted them, adding daffodil bulbs to the planting holes for colour in the spring. 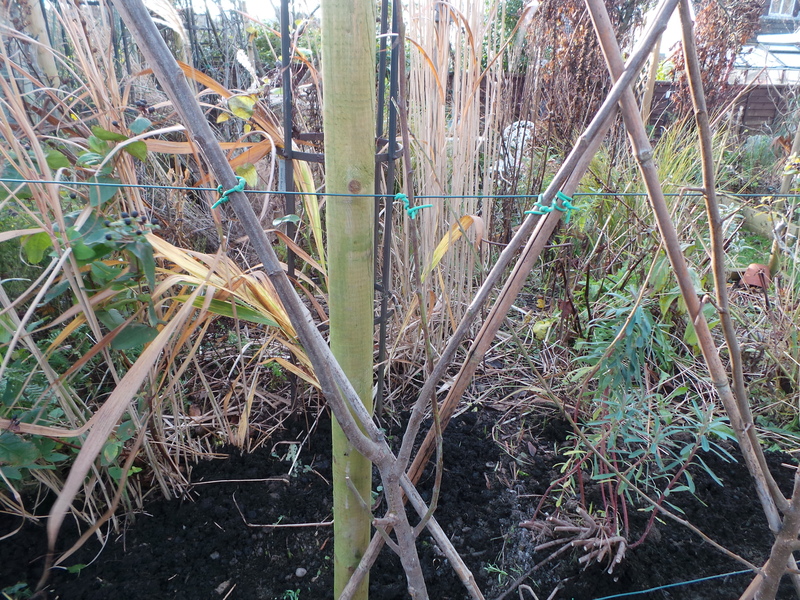 We then tied the new trees to their canes training them into fans. 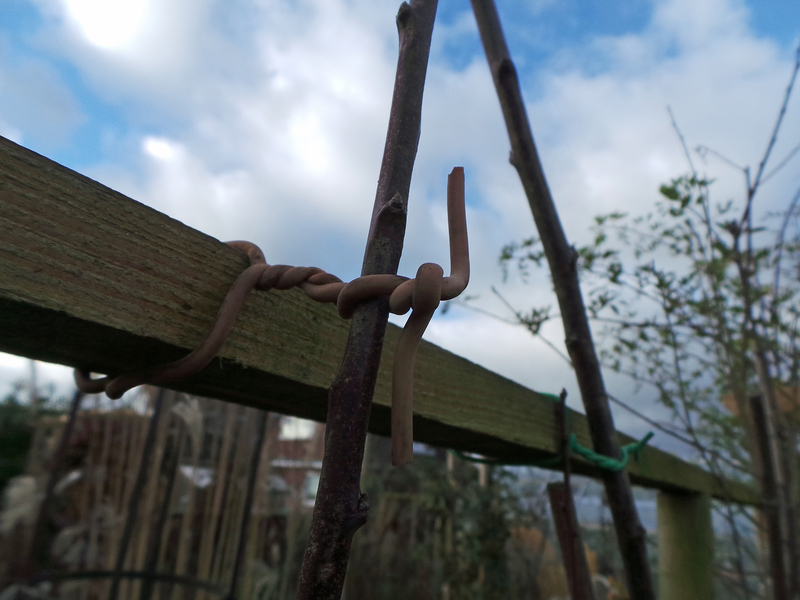 We used soft plastic covered wire to tie them in as this allows us to keep the branches away from the canes and supports. 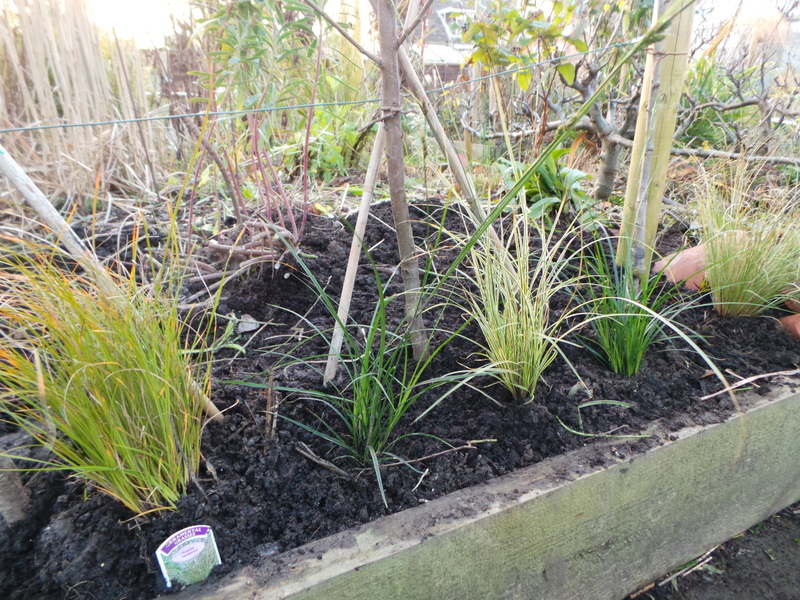 The final touch was to plant small ornamental grasses between the trees to add interest and some ground cover. 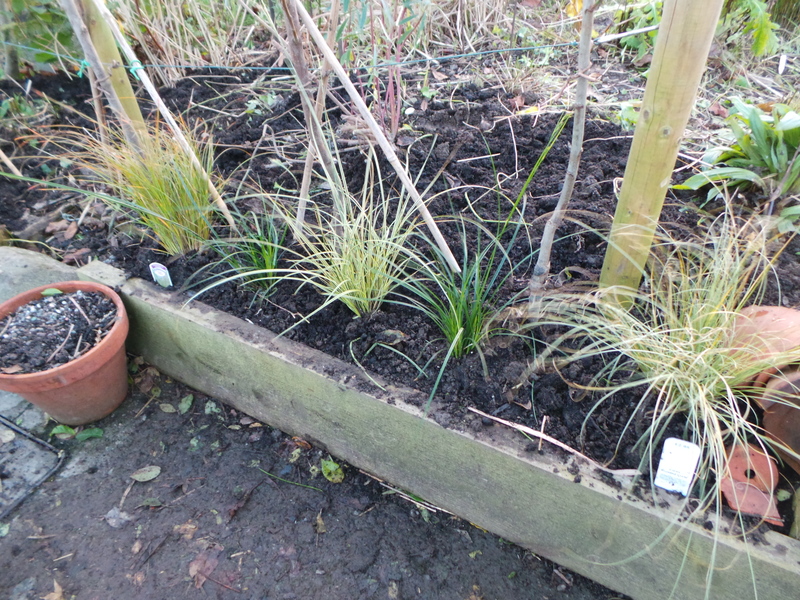 We chose different varieties of Carex for their different leaf colours and textures, because they stay small and because they are evergreen. And that was it – job done! If you are wondering which cultivars we chose here are their labels. 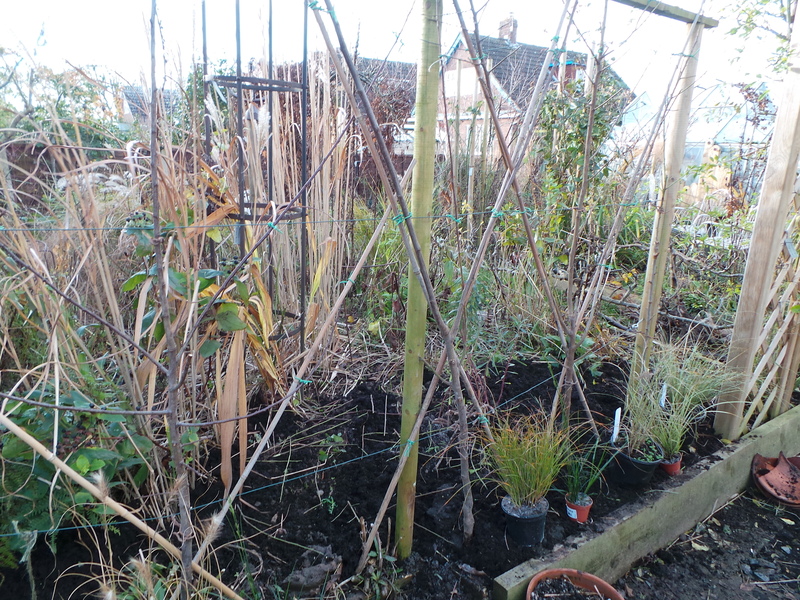 This entry was posted in flowering bulbs, fruit and veg, gardening, grasses, grow your own, ornamental grasses, spring bulbs, trees and tagged carex, fan trained trees, fruit and veg, fruit and veg growing, fruit and vegetable growing, fruit., grasses, ornamental grasses, plums. Bookmark the permalink. 7 Responses to Out with the old in with the new! Marvelous way to celebrate the new. 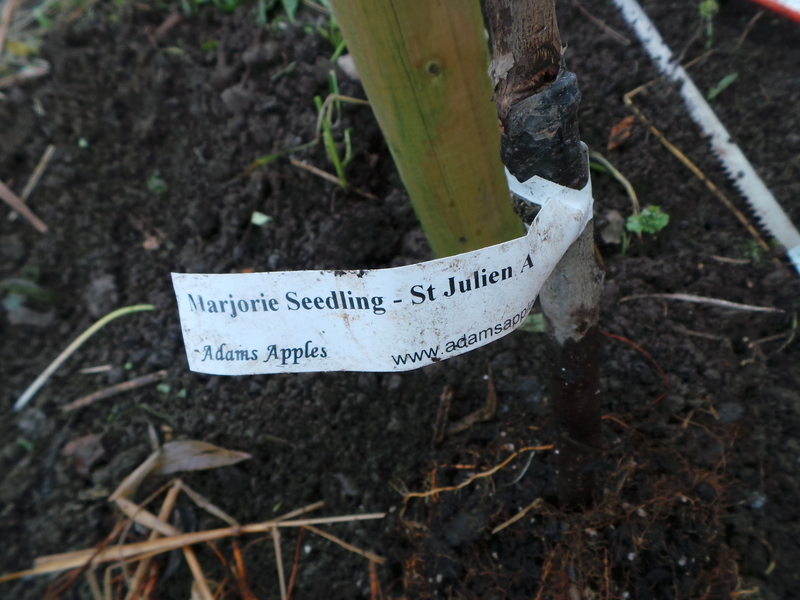 I have two apple trees that need replacing. One is half down and once removed. Then I must decide what to plant. Plum trees sound marvelous. Have to investigate to see if they’ll do well here (Mid-Atlantic, USA). Happy turn into the new. Warm wishes to Jude and you. 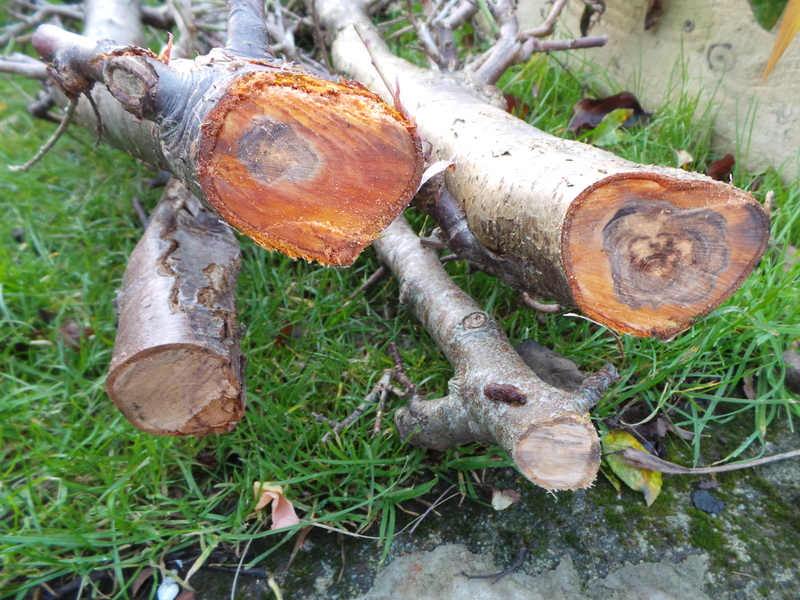 Enjoy the new year knowing the new trees are off to a good start. Interesting to see the techniques you used. Fascinating! I’m just starting to garden and love hearing others advenrures. Yours looks so rewarding. Happy gardening! There’s nothing like starting the new year off with new plants. 🙂 Here’s hoping you have a great gardening season. 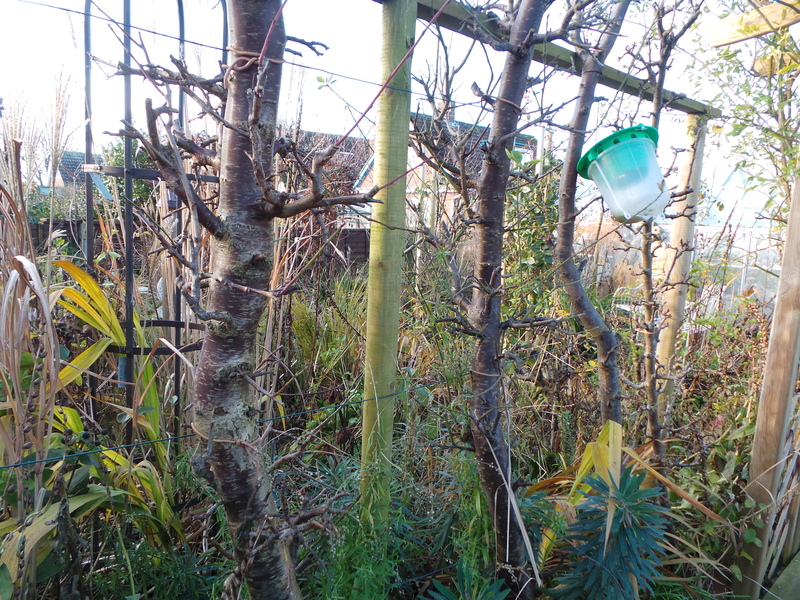 Best of luck with your plum trees… and I am envious of your ready supply of wood ash! 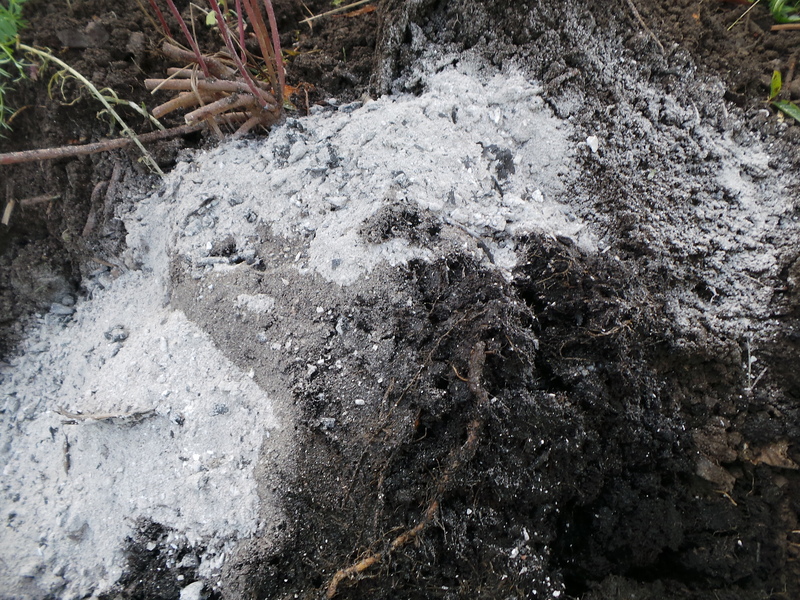 We are smokeless fuel only here in Edinburgh and I believe that coal ash is not so good for the soil. Ah well!